Union Pacific Locomotive 4141 will transport George H.W. Bush’s remains from Spring to College Station. This has been a somber and emotional week for the Bush family with the death of former President George H. W. Bush. It’s nonetheless also been a week of hectic travel, with the family accompanying the coffin over thousands of miles by car and by plane. On Monday it flew from Houston to Washington, D.C., for a memorial ceremony. On Wednesday, it is flying back to Houston for a repose and a Thursday morning service at St. Martin’s Episcopal Church. But for the final leg of the journey, the trip will be made by train – and no ordinary train. 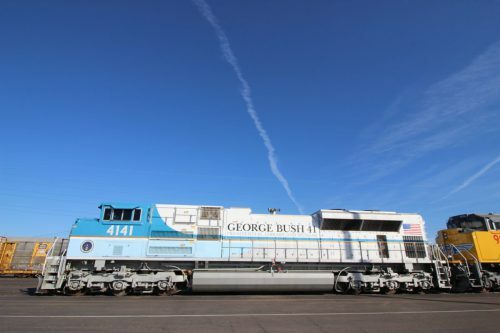 Union Pacific Locomotive 4141 will take Bush’s body to College Station, where he will be laid to rest at the George H. W. Bush Presidential Library Center at Texas A&M University. The two-locomotive, 11-car train has been in place at Union Pacific’s Westfield Auto Facility in Spring since last weekend. It will leave here around 1:15 p.m. on Thursday and arrive in College Station about two and half hours later. The train has the presidential seal, the words “George Bush 41 Presidential Library and Museum” printed along its side and is painted like the Air Force One presidential airplane. Union Pacific made the locomotive in Bush’s honor and unveiled it near his library as part of an exhibition in 2005. Since then, it’s gone to work across the country. Some of the towns the train will pass include Magnolia, Todd Mission, Navasota and Wellborn. This entry was posted in KRTS News and tagged President H.W. Bush. Bookmark the permalink.